Pyrex recently sent me their Classic Multipurpose Cooking Sheet to try. I've never used a glass baking tray before, so this was definitely a new one on me. It has a smooth top surface and a patterned underside and looks gorgeous. Made from the Pyrex standard tempered Borosilicate glass, the baking tray is also microwave and dishwasher safe and far stronger than standard glass. 32 x 26cm, the tray is ideal for baking tray bakes, pies, biscuits or cakes. It's also great for cooking pre-prepared foods such as samosas, spring rolls, sausages, oven chips or a multitude of other uses. We all like sausage rolls, but I think often the ready-made meaty ones are really quite poor quality meat. It's incredibly easy to make your own using ready-made puff pastry such as Jus-Roll. You can buy sausagemeat or I sometimes buy nice sausage, remove the skin and use that to make good quality, flavoursome sausage rolls. I decided to test my tray making sausage rolls for the veggies at my son's birthday party. I use Sosmix or an equivalent dry mix, with a little extra soy sauce as I wanted to give them a bit of bite. 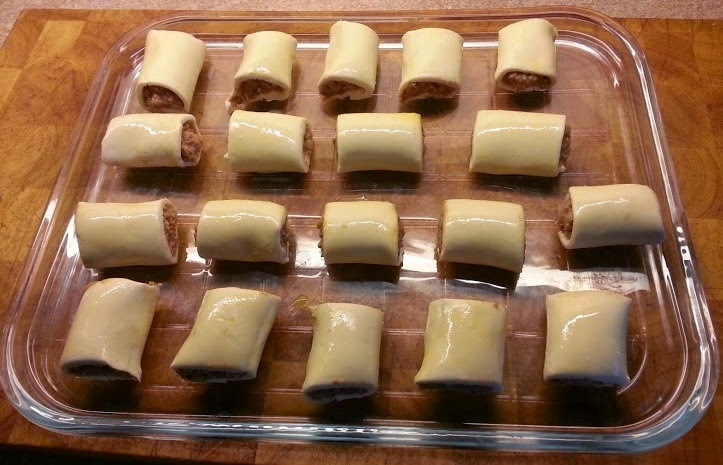 Roll out your pastry and place a line of sausagemeat along one edge. Roll the pastry from that edge until it nearly touches the rest of the pastry and then cut with a 1cm overlap. Wet the overlap with water to 'stick' it down. Repeat and cut them to the length you wish. Brush them with a little egg, then bake at Gas Mark 6, 200C, 400F for around 20 minutes until they're golden-brown. 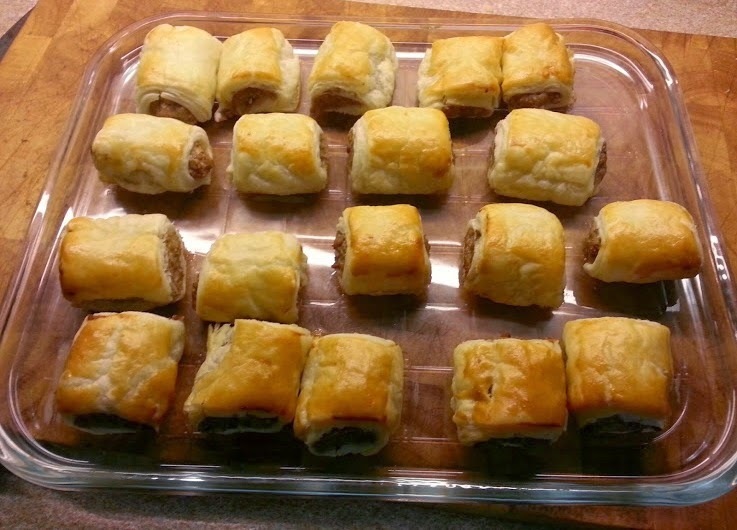 It's a lovely tray and my sausage rolls cooked really nicely and evenly. They hardly stuck at all, even though I didn't grease the sheet. I was pleased with how quickly the sheet cooled too,despite the weight of it. Whatever I cook on it, the Pyrex Classic Multipurpose Cooking Sheet won't stain or taint foods, because it cleans completely, and it has a 10 year guarantee. I really like that this cooking sheet is scratch-resistant, so I can use metal implements and don't need to worry about how I wash it. Like all Pyrex it's really easy to clean too, just leaving it for 2 minutes in water loosened all the flakes of pastry and they wiped straight off. If I make a large tray bake or I want to prepare tea earlier in the ay then I can put the Cooking Sheet into the fridge, I can even freeze it if I want. It's a really handy piece of equipment, and far more attractive than a regular metal tray. Ideal for oven-to-table and when entertaining guests. The Pyrex Classic Multipurpose Cooking Sheet costs around £12 and Pyrex products are available to buy at large supermarkets, Wilkinsons, Debenhams and a multitude of department and homeware stores, or online including Amazon. 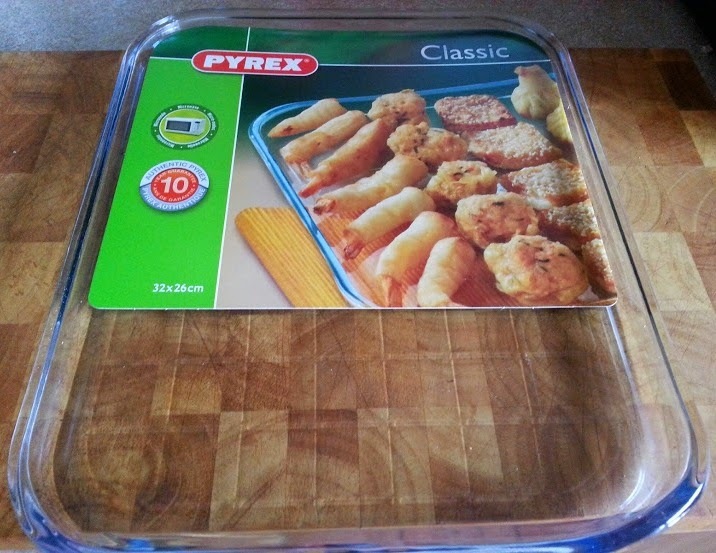 I was sent my Pyrex Classic Multipurpose Cooking Sheet for review. Yes, it is so convenient to transfer from fridge to oven and table! I must say that I have a few of their cooking-pans, and I like them!! They are super for that, it saves so much washing up! I had no idea you could get glass baking sheets. They look great and I am always impressed with Pyrex for quality. It does look amazing, so much nicer. I'm always embarrassed when people are round and I bring out the old tinware! 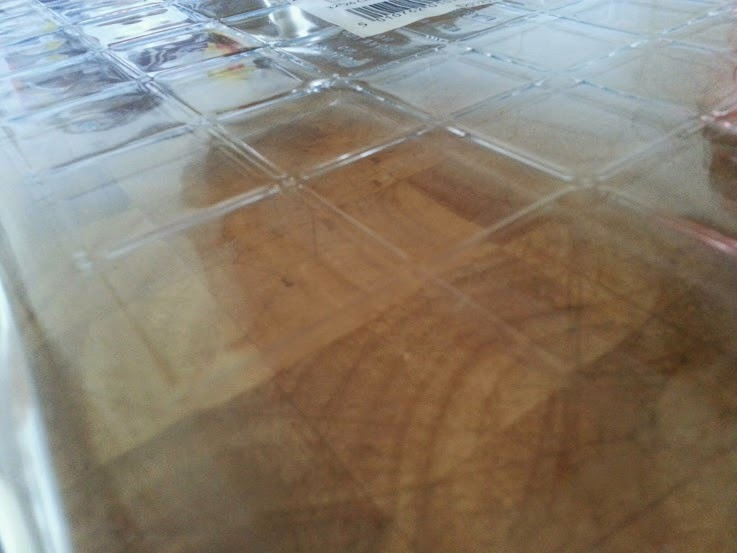 I use tin baking sheets and they do get a bit battered over time, this looks like a great alternative, I might replace mine with some in the future. I do think this is an investment. We seem to replace our metal sheets endlessly but this will last. Yep - fingers crossed! I haven't let the teenagers near it - they've broken 3 glasses this week already.. I'd never had one before, I'm really impressed! this sheet looks fab and I might have to go and get one as I am always replacing metal ones that have rusted in the dishwasher.